I'm using a quote stamp from Quietfire Design although I did butcher it a bit - sorry Suzanne. I removed the words "the teapot" and insert the words "the chocolate" using my funky style of lettering. I love this - and how you changed the sentiment to suit. I don't know where you find - or how you keep track of - all these challenges! Great job on this chocolate card! Love the buttons!! 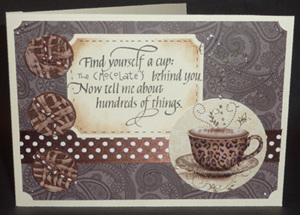 A really beautiful and 'sweet' card, Yogi! Love the colors, how you shaded your sentiment and the great DPs. Wonderful! The DS paper really worked well. Thanks so much for joining us at SSDS this week with your fun card. Thank you so much for joining us this week for the Phindy's Place challenge! An over the top sweet card!! Love it! Thanks for playing along with YNS. Many thanks for joining in with our Anything Goes challenge over at OSAAT, hope you will join us again.